Reel Talk Online: First Look: "Red"
After the miserable box office debut of Jonah Hex last week. you'd think studios would be a little weary about superhero movies. Nevertheless action star Bruce Willis brings to life the famous (?) 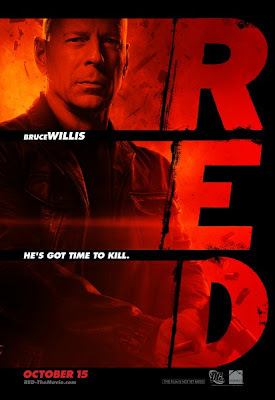 comic book character Frank Moses, a semi-retired black-ops agent who must call on his former team members for help when a old archenemy and assassin resurfaces jumpstarting an old feud in Red. Co-starring Morgan Freeman, Helen Mirren, John Malkovich and Mary-Louise Parker, Red hits theaters October 15.